With a name like this it had to be a potato pie, didn’t it? My first thought was that this would make a good Sunday night family tea, but I’ve now decided that slices would be good served up with a roast or b-b-que. Either way I think it would be a winner. 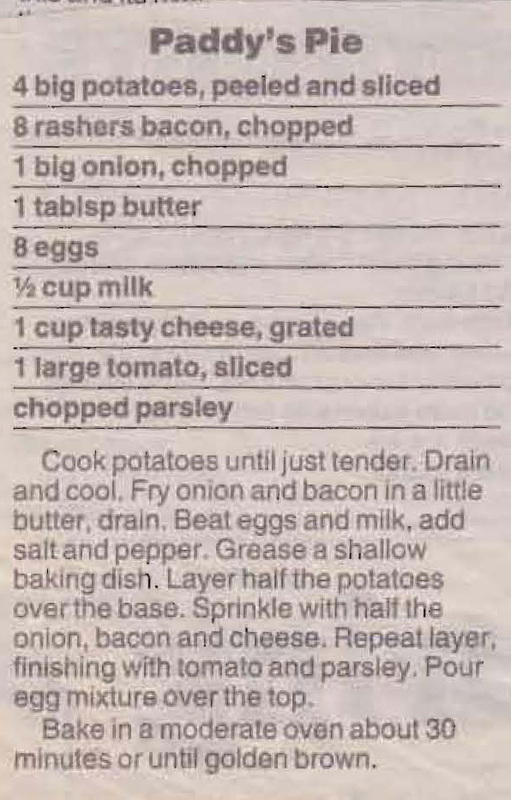 This entry was posted in All Recipes, Salads & Vegetables, Savoury Quiches/Pies/Patties and tagged 1990s, bacon, cheese, eggs, onion, paddy's pie, parsley, potatoes, tomato by bebsrecipes. Bookmark the permalink.